Constructed in 2014, this low maintenance and attractive property offers spacious and adaptable accommodation, coupled with a stylish modern décor and having been beautifully finished by the current vendor with particular attention to detail including high quality flooring, fixtures and fittings throughout. In brief the accommodation comprises; a wide entrance hall with Amtico Signature Range flooring and a separate cloakroom WC. There is a useful utility room with plumbing and space for washing machine as well as space for tumble dryer (including an extra gas point) with the impressive living room overlooking the front elevation and boasting a feature wall mounted electric fire with impressive multi LED light display functions. The Kitchen/Dining room will be found to the rear of the ground floor, finished with an incredibly high quality kitchen with contrasting grey and white units, upgraded appliances, window overlooking and patio doors with heat reflecting glass leading to the rear garden. There is also a handy cloaks cupboard on the ground floor, whilst to the first floor the window at half landing level allows light to appreciate the attractive décor and finish throughout the hallways and landing. 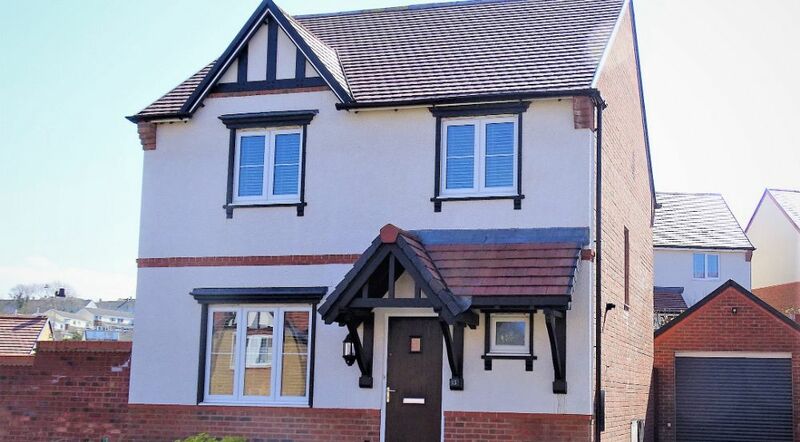 On the first floor are four well-proportioned bedrooms, with bedrooms one and two both having fitted wardrobes and the master having a luxurious en suite shower room. The bathroom comprises a stylish white four-piece suite with a separate shower unit again boasting a high quality finish throughout. To the rear of the property, the impressive fully enclosed level garden has a patio area with the remainder being laid to lawn. The garden enjoys a great degree of privacy as well as enjoying a sunny south facing aspect. A gate leads to the long driveway that provides off-road parking for 2/3 vehicles and the larger than average 19'8 x 10'5 garage with electric roller door with power and light connected. The agents have no hesitation in recommending this superb property which should be viewed sooner rather than later to appreciate the high quality and luxurious finish on offer. The property is situated in the town of Bideford which offers a full range of shops, amenities and facilities as well as further recreational facilities within the villages of Westward Ho! with its championship golf course and long sandy beach. Other places of interest in the locality include yachting and sailing within the river estuary at Instow and the nearby Tarka Trail well known for its cycling and walking as well as numerous other places nearby. Barnstaple the region main town is situated approximately 7 miles distance which in turn gives access to the M5 motorway at Junction 27 (Tiverton). CLOAKROOM with window to front, low level wc, wall hung wash hand basin, radiator, tiling to dado height, extractor fan and Amtico flooring. UTILITY ROOM with work surface with space for appliances under, including plumbing and space for washing machine, space and gas point for tumble dryer, eye level unit as well as wall mounted boiler (serving the property with domestic hot water and central heating), chrome towel rail and Amtico flooring. LOUNGE 15'4 x 11'2 (4.67m x 3.41m) with windows to front elevation, TV point, wall mounted electric fire with various flame display and light features, 2 x radiators and Amtico flooring. KITCHEN / DINING ROOM 20'3 x 11' (6.17m x 3.35m) An impressive room enjoying an aspect overlooking the rear GARDEN with window to rear from the KITCHEN as well as double glazed patio doors and side windows from the DINING AREA (This is heat reflecting glass). The Kitchen comprises of a range of eye level and base units in an impressive contrasting grey and white finish, there is an adjoining working surface with 1 and 1/2 bowl sink and drainer inset with attractive glass brick tiled splashbacking, integrated appliances including a Siemens Induction Hob, Siemens extractor Canopy over, Siemens double eye-level electric ovens as well as integral fridge and freezer. There is a breakfast bar with shelves inset, spot lights, extractor fan, 2 x radiators, telephone points and Amtico flooring. BEDROOM ONE 11'3 x 9' (3.43m x 2.74m) incorporating floor to ceiling double fitted wardrobe with hanging rails, shelving and sliding doors, TV point, radiator, fitted carpet and door into ENSUITE with fully tiled shower enclosure with main shower, low level wc, wall hung wash basin, extensive mirrored wall over, extractor fan, heated towel rail, shaver point, spot lights and Vinyl flooring. BEDROOM TWO 11'6 x 9'6 (3.51m x 2.90m) with window to front, floor to ceiling double fitted wardrobes with hanging rails, shelving and sliding doors, radiator and fitted carpet. BEDROOM THREE 11' x 6'6 (3.35m x 1.98m) with window to rear, radiator and fitted carpet. BEDROOM FOUR 8'6 x 7'6 (2.59m x 2.29m) with window to front, radiator and fitted carpet. BATHROOM A stylish white suite, comprising bath with mixer tap attachment, tiled surround, fully tiled shower enclosure with mains shower, wall hung wash basin, low level wc, extensive tiled splash backing as well as walled mirror fitted above the wash basin, shaver point, heated towel rail, extractor fan and vinyl flooring. 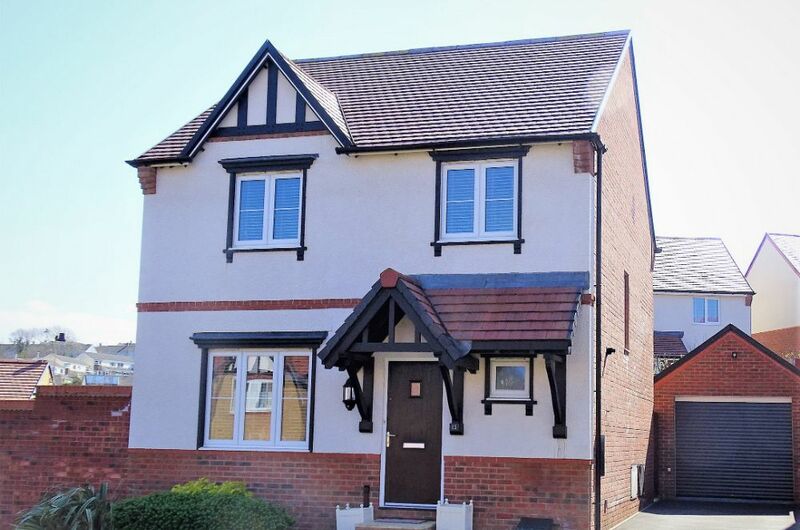 Directly to the front of the property is a low maintenance attractive flower bed with pebbles and hedges with a central pathway leading to the front entrance door. To the side a large private driveway offers off-road parking for 2/3 vehicles and leads to the SINGLE GARAGE 19'8 x 10'5 (6m x 3.18m) with electric roller door and power & light connected. The driveway provides pedestrian access to the rear garden, being a good size and level fully enclosed space with PATIO AREA immediately from the Kitchen/Dining Area, with the rest laid to LAWN and various flower and shrub borders. There is a handy space to the other side of the property providing a convenient location for bins or outdoor equipment. There is a SHED behind the garage on a concrete base, an outside TAP and POWER SOCKET. From Bideford Quay proceed up the main High Street and turning left at the top and taking the first right onto Abbotsham Road, follow this road, passing Bideford College on your left hand side, passing the left turning to Moreton Park Road and continuing straight. Take the next left hand turning into Birdwood Crescent and then the second left into Needs Drive. Follow the road until reaching the property on the right hand side with a number plate clearly displayed. 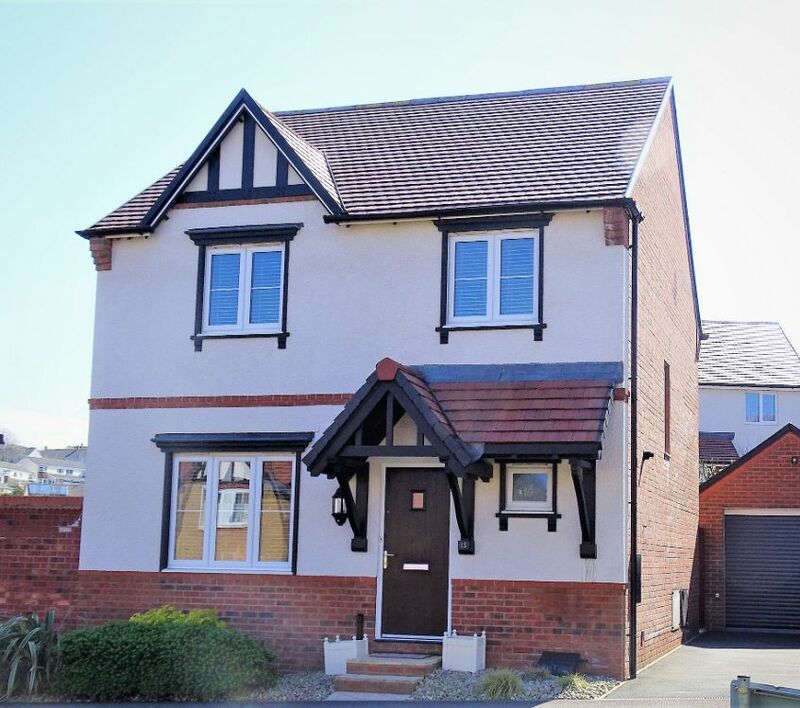 A spacious and attractive four bedroom executive style detached house, situated in a quiet location on a popular new development with driveway providing off-road parking for 2/3 vehicles, single garage and garden to the rear, enjoying a sunny aspect.